Remember when Hamer had Strat-type models? There was the Daytona, the T-62 and a couple other models. Anyone familiar with Hamer, knows they make consistent high-quality instruments with a reputation for top fit, finish and set-up. The T-62, pictured, came stock with Duncan Alnicos, a Wilkinson trem, and had a 7/8 scale body. Notice no tone control, instead a little toggle switch (see behind pickguard under bridge) for controlling an internally tweakable EQ boost circuit which made these remarkably inexpensive guitars, quite versatile. 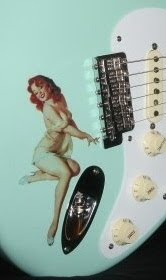 The Daytona model was a more standard Strat clone. Still, I miss the Hamer S-types of the past. And best of luck finding a Daytona or T-62 these days! They are few and far between. 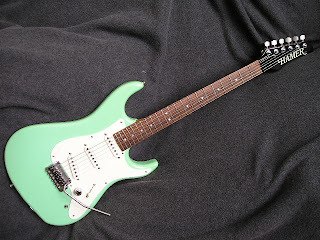 An eBay search and a bit of surfing about, reveals that Hamer Strats just aren't for sale. Tokai Strats are a helluva lot more abundant. Wish I'da bought one, back in the 80's. So where are they? Good question. Based on conversations with Hamer dealers around the US, I'm of the opinion that these guitars are in the happy homes of owners who just don't wanna part with them- kinda like Volvo or Subaru owners- as opposed to the vaults of a few collectors. Hamer has a kinda "vanilla" position in the market; not too edgy, but very well anchored because of quality. Don't pass up a classic Hamer S-type instrument if you see one for sale. Let me know if you don't want it, ok.